Hi beauties & welcome back! 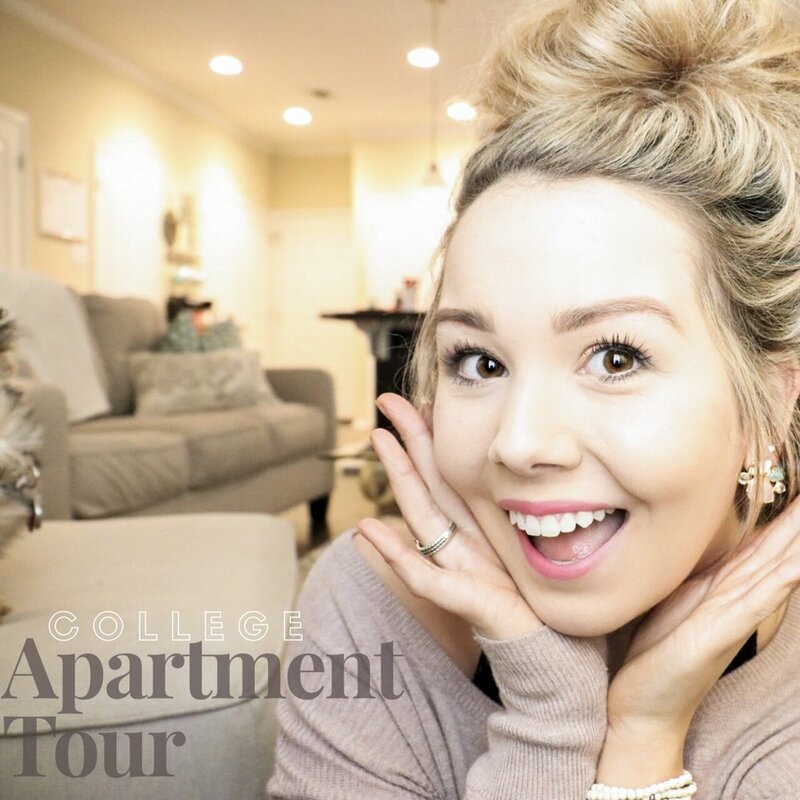 This post is my college apartment tour! 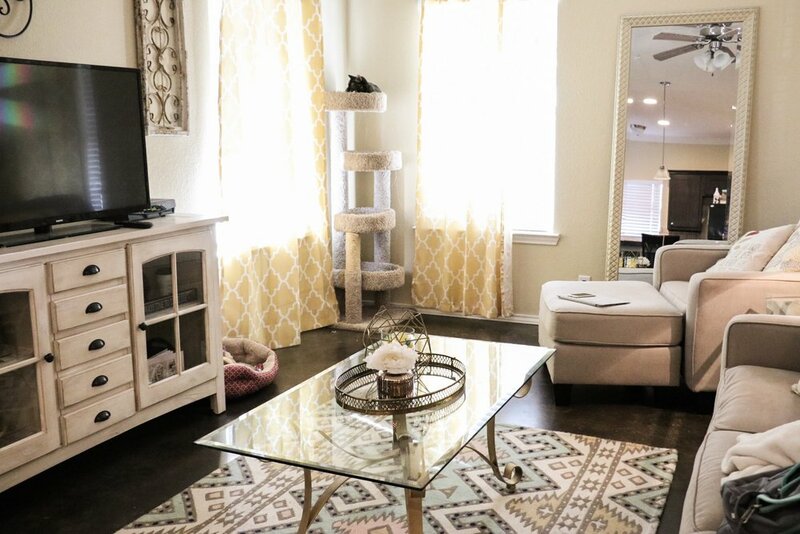 I have had a tooonnnn of questions about our apartment and well, here it is! I have had the BEST day and I feel like my normal, happy self again. Such a great feeling! My morning started off awful though, I ran out of gas basically, forgot my wallet when I finally got to the gas station and had to turn around to go get it & well, I missed class. But, I ended up calling to set up interviews, found my desk chair at a super good price, finished up my Vday shopping for my boyfriend, cleaned my car AND aired up my tires for the first time by myself (I know, hush). Oh and my Ulta order came a day early! Hahah anyways! This is only the downstairs, if y'all want to see the upstairs too, leave a comment below! Most of our things are from HomeGoods, Hobby Lobby, Target, or Pier One so just a heads up! I know a lot of people assume college living can't be fun or cute. It totally can! A happy home is a happy life (my motto..?) Haha! Anyways, a lot of this is inexpensive and is totally glamourous, for a college gal! Keep reading! The moment I saw this couch, I fell in love. We had originally ordered different ones, but we had issues with the delivery and they showed up 4 hours early- before we were even in SA and then they gave us horrible customer service about it, so we ended up running around SA looking for couches! We got these at a furniture store near by in August. But this one is similar! The cream rectangular pillows were from the furniture store, and the aqua colored pillows are from Home Goods! 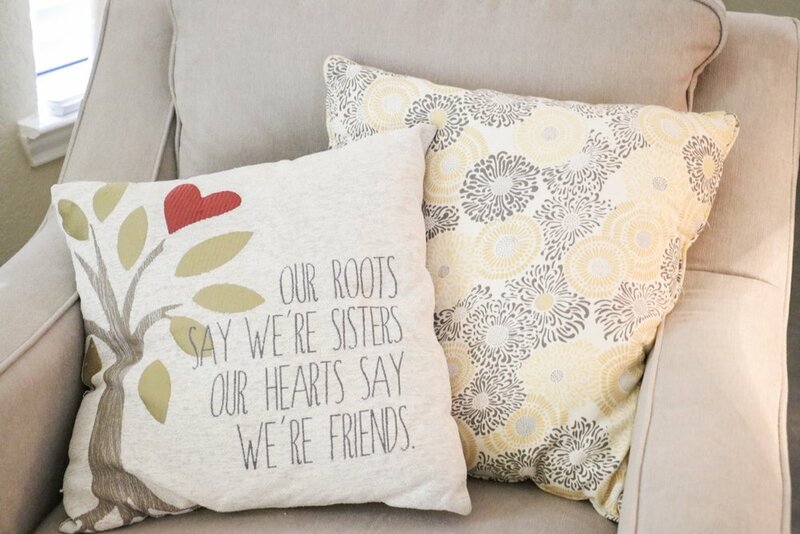 I believe these pillows are from either Pier One or Home Goods! 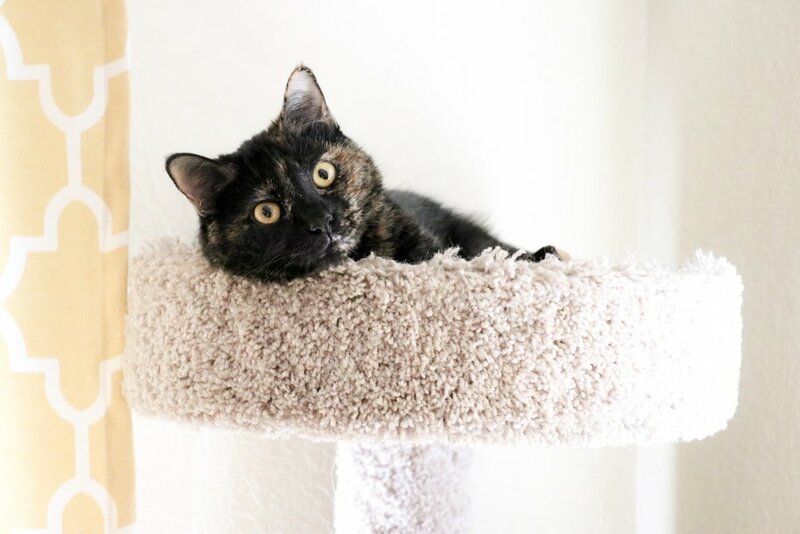 My sisters cat, Tenley, taking a pause from her cat-nap to pose for a photo! If you can't already tell by now, we love HomeGoods. We also got this wall mirror there too! This one is similar. Our living room floors and kitchen cabinets are a really dark brown. With that, and the walls being a dark cream color, we really wanted to bring light colors in to make the area brighter & prettier to look at. Therefor, I picked out this cream Tv Stand (HomeGoods). This one is very similar! We actually painted these tables! Gold tables are so in lately and therefor, overpriced in my opinion. We scored this coffee table and 2 matching side tables all for only $100! They were originally brown, so we grabbed some gold spray paint and created our dream gold tables! Aren't they beautiful? I love them! 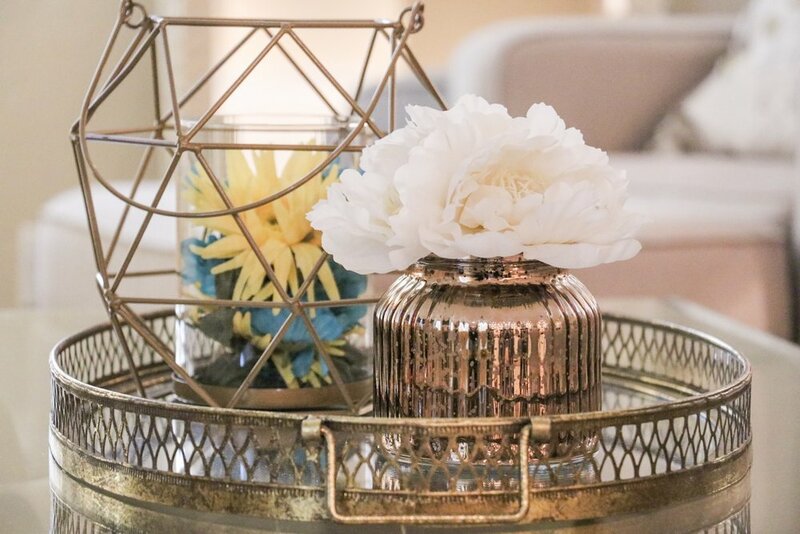 I love our center piece on this coffee table! All of it is from Kirklands and I just put some fake flowers in the candle holder to brighten up and bring some color in the room! If you're looking for a gold table, check out these! This one is beautiful too. I have had this coat rack forever. When we moved, I put it right by the front door and decided to put my hats on it! I love the way it looks. Brings character and a girly feel to the area! I mentioned these in my Instagram story. I got them today at Ross for only $3.99!! Behind our sink, we have 2 cute decorative plates from World Market placed on stands from Hobby Lobby. And then we currently have our empty wine bottles behind them (I plan on glittering them up soon)! 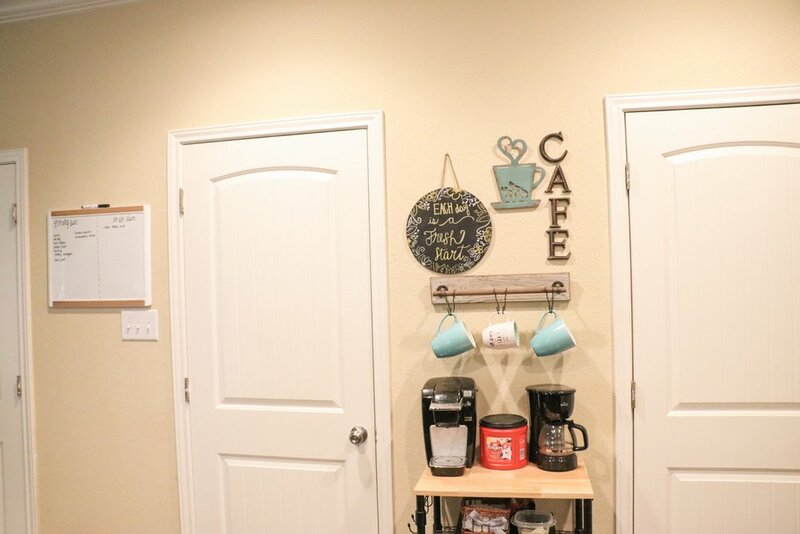 In our kitchen area, we made this cute little coffee bar! We got the stand from WalMart, the coffee cup holder from Hobby Lobby, the chalkboard from Target and the cafe and coffee decor from Hobby Lobby! 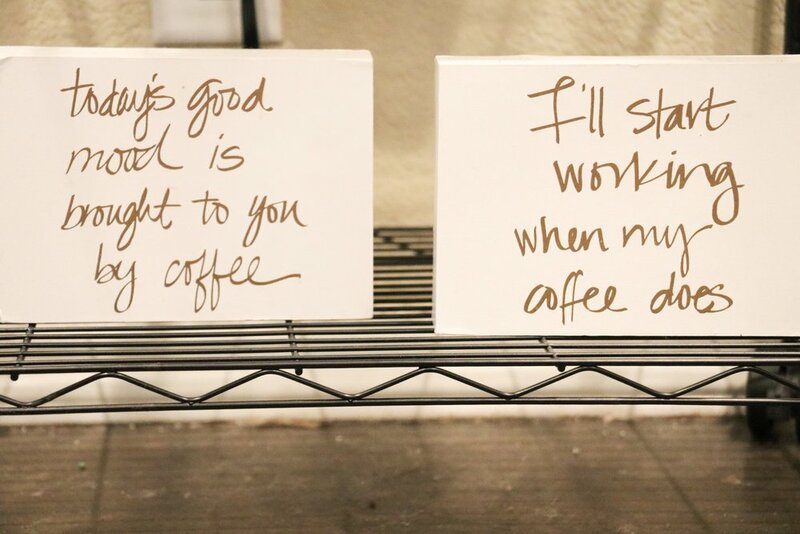 Placed under our coffee stand area, are these cute block quotes from Hobby Lobby! This stand by our stairway is from Hobby Lobby as well! We placed some knick knacks and photos. Mostly from pier one, and Hobby Lobby! Our little babies eating area. Bowls and matt from Home Goods! "The Best Therapist Has Fur And Four Legs" and in the box behind it are the animals treats! Both from HomeGoods! Thanks for visiting and I hope you enjoyed this post! I am considering doing an upstairs tour of my sister and I's rooms, but only if requested! Leave comments below and don't forget to subscribe! Have an amazing day! !